Does your pet have a formal affair to attend? Our Black Satin Bowtie Collar is the perfect choice for any black tie event! Range of sizes available to fit a pet from 2 to 100 pounds! Perfect for a dog wedding! Are you throwing a formal gala? When your dog needs a "black tie" outfit, make it simple with this clever Satin Bowtie Collar from Doggie Design. It is elegant by itself or pair it with our formal dog attire. 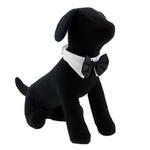 Even a plain black shirt paired with this tie will be a comfortable yet classy option for pets. Even dogs and cats that don't tolerate clothing will love wearing this simple collar that easily attaches with touch fastener. Never worry about ring around the collar since the black satin bowtie can be detached for hand laundering. This ensures there is no color transfer. The black tie could also be interchanged with another style thanks to this clever design. A dog or cat calendar shoot would look great in this for Valentine's Day or New Year's Day. Get creative and have fun. Don't forget to send us your photos too. Your pet could be our next Pet of the Day! Black Satin Bowtie Collar by Doggie Design Customer Photos - Send us your photo! On the evening of my piano recital, Dasher was appropriately dressed in black tie and tail. He was the highlight of the evening for everyone! Toro looking handsome with his new bowtie! Toro looking very handsome with his new bow tie! This is Gustavo looking very handsome in his Black tie for his Birthday!!! Taru looks like such a gentleman with his black satin bow tie. I absolutely adore his mature demeanor despite him being 4 months old. Bilbo is a dachshund/staffordshire terrier that enjoys dressing up for guests. Sandbar, our best man, in his wedding duds! Dachshund/Staffordshire terrier mix. Loves walks, snuggles, humans, and peeing on lamp posts. This is Charming, an almost 3 month old Yorkie! He loves his toys but his favorite thing to play with right now happens to be socks! All day long he runs around playing with his Mommy and Daddy but once night time comes he just wants to cuddle! He just adores his new outfit and can't wait to show it off to all his friends! Posted On 02/12/17 by Sandra L from Estero, FL Yes, Sandra L recommends this product! Posted On 12/29/16 by Mary Messere from Dunkirk, NY Yes, Mary Messere recommends this product! This is perfect for my male Rottie. he won't wear a tux. Posted On 08/22/16 by Brittany from Tucson, AZ Yes, Brittany recommends this product! We love this bow tie and the sophistication it brings out in our pup. It is easy to put on with its Velcro strap and immediately gives off a dapper aura. I would recommend this product highly for anyone looking to jazz up their pup's look! Posted On 04/25/16 by Cijai B from , AZ Yes, Cijai B recommends this product! Posted On 04/22/16 by Nancy Watson from Freeman, VA Yes, Nancy Watson recommends this product! Placed my order while vacationing/camping out with my horse. Easy as pie and my order was waiting for me when I arrived home. Posted On 04/21/16 by LisaDawn M from Olathe, KS Yes, LisaDawn M recommends this product! Cute and attractive collar with bow tie. READ size chart. I got wrong size but was able to extend collar with matching Velcro easily. Posted On 04/18/16 by Charlene S from San Diego, CA Yes, Charlene S recommends this product! I love this accessory! For special occasions, Cody will not be beat out for cuteness, as he wears his very dapper Bowtie!! It is very durable and nicely made!! Posted On 02/29/16 by Cijai B from , AZ Yes, Cijai B recommends this product! Posted On 12/18/15 by Diane A. H from Cornville, AZ Yes, Diane A. H recommends this product! I wish the size of the tie itself was larger to fit a larger dog. This one disappears. The quality and fit around the neck is good, just the size of bow tie itself could be larger. It's perfect for smaller dogs. Posted On 07/31/15 by Lindsay R from Rochester, NY Yes, Lindsay R recommends this product! Super cute and love that it's velcro so you can adjust it to any size. Posted On 06/20/15 by Jeannie F from Rochester, NY Yes, Jeannie F recommends this product! 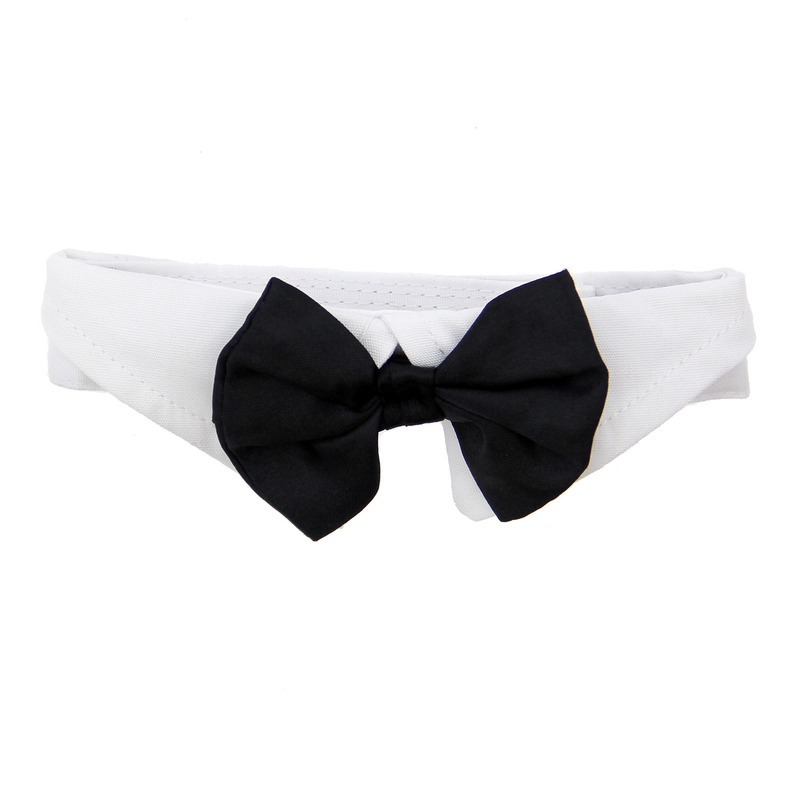 I absolutely LOVE this Black Satin Bowtie with White Collar! Cooper looks so very handsome in it! As the "4 legged brother" of my daughter, the Bride, he complements the entire wedding party in his "new attire." I plan to order one for his nephew, Mickey, the 4 legged "son" of the Bride. Totally classy and fits perfectly! Posted On 05/28/15 by Penelope S from Easthampton , MA Yes, Penelope S recommends this product! I bought this for my hairless cat who is going to be part of our wedding this weekend, & it is perfect! He looks so handsome & will be ready for our family portrait! The Velcro makes it super easy to put on and off, & he totally doesnt mind it being on! We love this bow tie! Posted On 02/09/15 by bueno501 from , CA Yes, bueno501 recommends this product! Posted On 01/08/15 by Cynthia D from Shreveport, LA Yes, Cynthia D recommends this product! Just too cute. This with his black tee with silver sequin tee shirt will make the perfect outfit for a "dog party" at the nursing home. Balooh is a Therapy Dog and this as well as the other outfits I have purchased from you have really made a hit with the elderly residents at the nursing home. Posted On 12/24/14 by Margret M from Lexington, KY Yes, Margret M recommends this product! A very dapper looking bow tie! Makes my boy look very dashing. Posted On 12/22/14 by Katherine H from Los Angeles , CA Yes, Katherine H recommends this product! I got a medium size for my Maltese dog and it fix perfect and my dog loves it. Posted On 10/08/14 by Diane J from Hillsborough, NJ Yes, Diane J recommends this product! This with his BOO shirt will make a good costume for him to be in the pet parade if he is well enough to do it. I have the red plaid one from last year which he wore at Christmas. 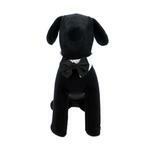 I was searching for dress harness for my dog and i saw your website and liked the selection.